There are a number of problems that could be hindering your website’s organic performance. Some may be obvious, and others might require a little digging before being uncovered. As a follow up to my previous post, 3 Issues an SEO Audit of Your Website Could Uncover, I’m diving into three more issues that an SEO audit could identify. An XML sitemap lists a website’s pages, helping search engines to find and index the pages so that they can appear in search results. 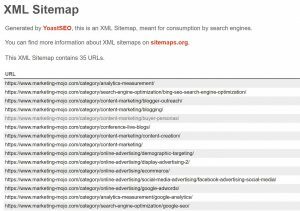 If your XML sitemap isn’t up-to-date, your pages may not be indexed, causing you to not rank in organic search results and lose valuable traffic to your website. An outdated XML sitemap can occur if you make the switch from HTTP to HTTPS (i.e. http://www.example.com > https://www.example.com), change your URL structure (i.e. https://www.example.com/blog > https://www.example.com/resources/blog) or frequently add new pages to your website such as blog pages or product pages without updating the URLs listed in your sitemap. A mobile-friendly website is a must in today’s world. Three years ago, Google released a mobile-friendly ranking algorithm designed to boost mobile-friendly pages in Google’s mobile search results. 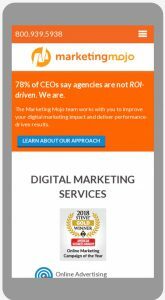 More recently, Google began rolling out mobile-first indexing – Google will primarily index mobile content and use that to decide how to rank results on both desktop and mobile. Additionally, a non-mobile-friendly website is simply offering a poor user experience to a majority of searchers. So, if your website isn’t mobile-friendly, you’re likely missing out! You simply may have not yet made the move to a responsive design website or developed an “m-dot” version of your desktop website. A responsive website (recommended) shows the same content on all devices, but the design is rearranged to best fit the device being used. An “m-dot” website is a separate mobile website (i.e. mobile.example.com), often with less content than the desktop website, prioritizing content that is most useful for mobile visitors. A 404 error is an HTTP status code that means that the page you were trying to reach on a website couldn’t be found on the server. Internal broken links (links on your website that direct to a 404 error page) are always a bad user experience. If a user clicks a link on your website expecting to find the content they are looking for, but is sent to a 404 error page instead, they may be disappointed enough to leave the website altogether. External broken links (links on another website that direct to a 404 error page on your website) could potentially diminish the positive SEO benefit you receive from having that backlink. A 404 error can occur when a webpage has been moved to a different URL or deleted without being redirected. Are you worried that your website may have one of these issues or others? Get an SEO audit and ensure you are doing all you can to beat out your competition.